This year Tom Hunter and myself decided we would commit ourselves to bringing you consolidated rankings throughout the season. Tom has been the backbone of the prospect reports attached to these rankings and I’ve been trying to make sense of what is causing the players to rapidly rise and fall in the nine different rankings we use. For the final* rankings of the year, we’ve taken a slightly different approach to presenting the rankings. Consider it The Bloggers Tribune Draft Guide. We have the Consolidated Rankings for each player (based off our draft ranking services), but we’ve also included our own personal rankings for each of the consolidated top 30. Our rankings are not included in the consolidated numbers, so they are as pure as you can get when you’ve got rankings based on Craig Button, and Damien Cox’s sources. We also have a write up for each player, which should give a bit of context into why they are ranked where they are. The asterisk you’ll see following ‘final’ indicates that Mr. Bob McKenzie will be holding out until draft week to share his final list. While those rankings may cause some movement in the Consolidated Rankings, it won’t be a dramatic reordering of players and of course we’ll provide you with an update at that time. The full explanation of the rankings follows the top 30 profiles. Jon’s Take: Despite the fact that Matthews has managed to finish up the year without the unanimous first overall title, it seems reason to expect that he’s still going first. A well rounded, but not necessarily flashy center, Matthews finally steps in as the Leafs first true top line center since Mats Sundin. Matthews even plays a similar style to Mats. He does pretty much everything at an above average level. He’s not going to be particularly great defensively, but you don’t hate having him out there in his own zone. He won’t missile himself into players, but he’s not afraid of contact. He can score highlight reel goals, but you are mainly getting technical excellence out of him. He’s the best all-around player in the draft, if anyone says otherwise they’re either not paying attention or being contrarian for the sake of it. Matthews is the prototypical big, strong two-way center that every team tries to build around. He might never score at the rate Laine will and he probably won’t ever compete for the Art Ross but what Matthews is the kind of three-zone player you’re looking for as your team’s foundation. Playing against NHLers at the World Championship, Matthews was called upon to take the majority of Team USA’s defensive zone faceoffs. That is something you want to see from your number one center and the fact that you get it from Matthews at 18-years old is a great sign. Jon’s Take: Patrik Laine is an incredibly fun player to watch, and he makes you want to compare him to many of the most exciting forwards the NHL has seen over the past two decades. This is a pretty good reason to be excited if you’re the Jets, but you may be inheriting the Finnish Flash 2.0. Of course, Laine vs. Matthews has been somewhat of a forced debate thanks McKeens and ESPN placing Patrik ahead of Auston. You can make a strong case that a couple of years down the road we’ll be looking at better offensive numbers for Laine, and taking Matthews could look like an oversight. I’m still willing to bet that most teams consider centers to be better overall players than wingers and will factor that into their decision making process despite the fact that Laine has the ability to embarrass his opponents with a quick shot and his creative approach to generating offense. Tom’s Take: Laine is a great offensive talent. His shot is at the top of the class and he has the scoring instincts that rival the best in the game. Without the puck, he does a great job of making himself available to his linemates and has a sense of where he should be in order to maximize his team’s offensive zone attacks. He can play on either wing and will fit in perfectly with a distributing center that like to drive a team’s possession. He’s far from a perfect player. He has started to reduce his turnovers, but that is still a part of his game that needs improvement. Laine also has the stick reach and speed to be an elite defender, however, the defensive awareness does not always seem to be there. He’s brash, she’s flashy and Laine plays with a confidence that you like to see from your team’s star player. He wants to be the best at what he does and will go out of his way to try to prove any doubters wrong. Jon’s Take: Before there was Laine vs. Matthews, there was Laine vs. Puljujarvi, and that’s probably still the more reasonable conversation considering that Puljujarvi has been going almost step for step with Laine throughout the 2015-16. Puljujarvi dominated the World Juniors, and U-18s, while Laine faired better in Liiga play and earned a World Hockey Championship invite, so Laine still gets the edge there, but there’s an argument that Puljujarvi might be the more complete player. Tom’s Take: People seem to have forgotten that at the World Juniors that it was Puljujarvi that was Finland’s best player, not Laine. Puljujarvi drove the offense for the line and played facilitator for his elite linemates. After being hampered by a few nagging injuries, Puljujarvi will has now fallen to a clear cut number three, but the debate between he and Laine should probably be a little louder. He brings power, skill and a desire to improve. He’s a competitive player that wants the puck on his stick at all times. He is not a pure goal scorer the way Laine is but he is very good one on one and has a knack for making the smartest play that is available to him. He’s a little more raw that the first two but he plays a game that could very easily be translated to the center position if the team drafting him desires. Jon’s Take: Admittedly I know I am probably someone who undervalues Tkachuk. He’s proven effective with Dvorak and Marner and that he can create plays as well as finish them. He adds a necessary physical presence to the top six without sacrificing talent, and that more than makes up for not being a standout skater. Tom’s Take: Tkachuk is one third of the best line in junior hockey. Some have dismissed his point production this year because he is playing with two superstars – and yes he does lead the OHL in secondary assists – but the fact is that Tkachuk is a key part of the line. He has offensive instincts that you look for in a top line winger and his play without the puck allows his linemates the time and space to create offense. He has finishing ability in close and a decent enough shot but his real value comes in his ability to read the play and react quicker than most. He’s a bid body but he’s far from the power forward his father was. He’ll need to become stronger on his skates and with the puck if that’s the kind of player he wants to become at the next level. Jon’s Take: Dubois isn’t a particular standout at any one thing, but he seems to be above average at most. His speed is knock, but his intelligent approach to the game makes up for that. He’s often listed as a winger, but has spent a lot of time at center this year, and it’s likely that the team that takes him will at least explore the idea of adding size down the middle. Worst case scenario is they’ll end up with a talented winger who can play in any situation. Tom’s Take: Dubois is big and smart, two things that will serve him well in the NHL. He grew up playing left wing but played a lot of center this season, something that will be viewed as a definite asset by scouts. With the speed and strength to get past lesser defenders and a very good wrist shot, Dubois has the ability to score off the rush that you like to see from a top-6 forward. He’s a very good player that grew exponentially as the season went on. Formerly a pass-first winger, Dubois took a lot more shots this season and it paid dividends. He’s not a defensive dynamo but he’s no slouch either. He is definitely one of the more complete players in this year’s draft and someone who could end up being the best player outside of the big 3. Jon’s Take: Alex Nylander did an excellent job of living up to the family names this year. An excellent World Juniors, and strong season in Mississauga are signs that he’ll have no trouble putting up points at the next level. Nylander’s ability to make creative plays at a higher speed are what differs him from the rest of the top ten options so far, and like his brother was the answer for the Leafs. Nylander could be the best option for a franchise with very few skill prospects in their system. Tom’s Take: We’ve all see the highlights from earlier in the season. Nylander has the puck skills to dazzle on any given shift. The problem is that when you watch his whole game, those dazzling shifts are are far too infrequent. He’s fast, mobile and like most 18-year olds, he needs to get better in his own half of the rink. He shies away from contact and when the play gets too physical he has a hard time creating his own offense. Playing with the right center – as he did in Mississauga – Nylander can thrive. With or without the puck, when he has the time, he can show offensive instincts that may not be matched in this year’s draft. He’s just not necessarily going to have that kind of time in the NHL. Jon’s Take: Juolevi went into the year as possibly the most underrated defenseman in the draft class. By the time the World Juniors ended he may have been the most overrated. Juolevi is a very good player and has helped make good times like London and Team Finland better, but he still seems like someone who is benefiting from an ideal circumstance rather than truly being that top flight defenseman. Tom’s Take: Juolevi blew me away when I first saw him play this season. In one of his first games in the OHL, he looked like a professional among kids. After that, however, the growth didn’t come as quickly as I had expected. He was sheltered quite a bit by London. He didn’t play much on the penalty kill and would often see minimal ice time in the third period of close games. He was great at the World Juniors when Finland relied on him as a top pairing defender, which makes me think that he could have thrived in London if Hunter had let go of the reigns a little bit. Jon’s Take: I have a huge appreciation for Clayton Keller and think that the player who is drawing comparisons to Mitch Marner is going to be the steal of the draft. After Auston Matthews there’s a steep drop off when it comes to centers in the 2016 draft. Not that the next few options aren’t good, but they are having difficulty climbing into the top ten rankings in draft year that is much deeper on defensemen and power wingers. He’s put up great numbers in the USNTDP and is one of only a few natural centers who look like surefire top six forwards. He’s equally capable as a playmaker or a finisher, who has one of the better shots in the draft. Tom’s Take: Keller is one of the most naturally gifted offensive players in the draft. He has game-breaking talent that could lead him to be an offensive dynamo in the NHL. He doesn’t necessarily have elite top-end speed but his lateral movement and high-end puck control makes his game quicker than his foot speed would suggest – a lot like Mitch Marner. Keller is a very smart player. He has the IQ and vision to see the proper play, and the hands to execute it. He’ll likely be more of a playmaker as a pro, but he has the finishing ability to score on his own when need be. His two-way game is strong, the one question mark is if it will be able to translate to bigger and stronger competition. Playing for the USNDT, Keller was able to match up against the opposition’s top forwards but he is going to have to get a lot stronger if he hopes to do that in the NHL. Next year at Boston University could go a long way in his physical development. Jon’s Take: Rounding out the top center options of the first round is Logan Brown. Brown is 6’6 and that’s usually something that speaks to NHL GMs. What speaks to me is the fact that Brown put up better than expected offense and makes the most of his long stride. Brown was another U-18 standout, that proved that he should be considered at top six forward in the pro ranks, and not be converted to a bottom six specialist based on his stature. Tom’s Take: Logan Brown had a very tough start to the season. He was struggling in Windsor and looked like a guy who would be drafted near the end of the first or even fall into the second round – if he weren’t 6’6, maybe even further. He took off in the second half though. Brown became one of the more dominant centers in the OHL and followed it up with an incredible performance at the U18 tournament for the US. Brown’s skating is getting better but it will have to continue to improve to justify the top-10 ranking some are now giving him. He’s got decent puck skills and very good passing ability but he’s not a guy who is going to beat you off the rush. The tools are there for him to be a good second line center in the NHL but to expect anything beyond that might be a little foolhardy. Jon’s Take: Mikhail Sergachev is a good defenseman that has been climbing up the rankings throughout the year at a similar pace to Juolevi. His numbers are nearly identical to Juolevi, but he doesn’t have as strong of a team around him, and at the U-18s, Sergachev was pretty much the only recognizable face on the Russian squad. Picking a defenseman this year seems to be more about personal preference than anything thing else, so it wouldn’t be a surprise to see Sergachev get picked first, but it wouldn’t be a surprise to see him passed over for Jake Bean or Dante Fabbro either. Tom’s Take: Sergachev is a guy who has opened a lot of eyes late in the season. He is a big, athletic defender that can skate incredibly well. Sergachev is strong on the puck and uses his strength to protect the puck on the rush. He’s won’t always make the ‘easy’ play and that sometimes gets him into trouble in his own end. He will look a little out of sorts on some shifts, but a lot of that might be explained by Windsor’s disjointed playing style. He has the potential to be a top pairing defender and powerplay quarterback in the NHL. The key will be for him to develop a smarter game, something he definitely has the instincts to do. Jon’s Take: I was decidedly late to the Jost party. I was quick to point out that BCHL numbers aren’t particularly meaningful when you’re a few steps ahead of the rest of the league. The point is though, Jost was definitely a few steps ahead of the rest of the league. At the U-18s I finally came around when it was clear that Tyson can dominate against his top peers from around the world as well, and given the lack of high end centers in this draft, Jost shouldn’t be overlooked for wanting to maintain his NCAA eligibility. Tom’s Take: Jost is a fast player, not just in terms of how he skates but how he makes plays. He thinks quickly and can perform offensive plays in a way that has other standing around watching. He plays a lot of center but can also play on the wing and is no stranger to winning battles down low and against the boards. Jost brings an energy to each shift that you like to see and is able to frustrate opponents both with and without the puck on his stick. he can stand to improve his game in his own end but Jost is far from a liability defensively. A less defensively aware Zach Parise? A slightly less offensively dynamic Patrick Kane? a Brad Marchand that you don’t want to punch in the face? It’s hard to peg down a comparable but Jost definitely has the skills to make an impact in the NHL. Jon’s Take: Chychrun started the year ranked by many as the second best prospect after Matthews. There was talk that he could potentially overtake him. Despite the fact that Chychrun had a very strong season in Sarnia he tumbled in the rankings, even moreso than what Noah Hanifin experienced last year. Most people will remember Chychrun more for being left off of Team Canada at the World Juniors and getting posterized by Max Jones, than the fact that he’s one of the higher scoring defensemen available in this year, and at 6’3 has the speed, size, and physicality to be effective at the pro level. Tom’s Take: Jakob Chychrun is the kind of defender you want to build a blueline around. Scouts had all year to pick his game apart, mostly because he was on the ice in every single situation for Sarnia this season. He’s a big, strong, smooth skating defender that doesn’t make mistakes with the puck on his stick. He has fallen in the rankings but by all accounts he was very impressive in his interviews during combine week. He has all the talent to be a top paring defender if not a franchise cornerstone. He just needs to simplify his game a little and stop over-thinking his play. The one caveat in all this is that there are rumblings that his shoulders may be a concern. He might have to prove to teams that he has a clean bill of health before they are willing to invest a top 5-6 pick on him. Jon’s Take: Bean might be one of the better athletes available in the draft and a team looking for a defenseman might luck out by having their decision made for them by having Juolevi, Sergachev, and Chychrun off the board. Jake has the offensive abilities needed to be a big ice time guy at the pro level, but he’s proven to be capable in his own end as well. Hishigh-end speed will help in his learning curve, and makes him a safe bet for being a difference maker in the NHL. Tom’s Take: Bean is a late bloomer. He wasn’t selected at the WHL draft, but surprised many with a standout rookie season. He’s a left-shooting defender that spent a lot of time playing on the right side this season and showed a poise and intelligence to move back and forth given his coach’s desire. Bean is a tremendous skater with great acceleration and can move the puck out of his own end with ease. He doesn’t have a thundering shot from the blueline but he’s a guy that takes the ‘smart’ shot that gets through traffic. He may not have the most natural skill of the defenders in the first round but he very well may think the game better than any of them. He seems like a guy that might not top out as a top paring guy but is a safer bet to be a regular in the NHL than many of his peers. Jon’s Take: Being the best right-handed shooting defenseman in the draft when the NHL is coming to terms with a lack of high-end RHD makes me believe that Fabbro is capable of sneaking into the top ten. He makes smart plays and like Tyson Jost, he proved at the U-18s that he could more than keep up with players outside of the BCHL and you could make the case that Dante was Canada’s top defenseman at the tournament. Fabbro committing to Boston University is a sign that he’s going to be developing well in the next couple of years and going up against strong competition. A team with a bit of patience on their prospect is going to be rewarded nicely here. Tom’s Take: Fabbro is another guy that opened al ot of eyes atr the U18 tournament. His performance went a long way to dispelled the theory that he was only dominating against lower level cometition in the BCHL. Fabbro is a true two-way defender that has the skating ability and vision to drive a breakout. He makes smart decisions under pressure and shows a poise you want to see from a top defender. Fabbro can quarterback a poweplay and the fact that he’s a right-handed shot might get him drafted ahead of other second-tier defenders. Jon’s Take: A center with size, albeit one who hasn’t figured out how to create as offense as well as some of his peers. McLeod could be the fastest player in the draft and that’s got to be a huge incentive for teams to take him early. McLeod might be more of a two-way center down the line, but there’s a good chance that he could be regarded as one of the best in that area given his abilities. Tom’s Take: McLeod is a player that has been all over the draft lists this season, but anyone who knows me knows how high I am on him as a prospect. When discussing draft eligible prospects, the most frequent criticism is likely ‘play without the puck’ or ‘needs work in his own zone’, neither of those things are relevant to Mikey McLeod. The centerman plays as complete a game as you will see from an 18-year-old. McLeod has the instincts to play without the puck and works to keep himself in position to make things easier on his defensive teammates. He has the size and strength to line up and shut down the best centers in the league. All that said, he is far more than a defensive center. He is likely the fastest skater in the draft and with his size, he is more than just fast, he’s very strong on his skates. While Nylander made the highlight reals, McLeod was often the one who drove offensive possession for that line. He is a very good distributor but probably needs to be a little more selfish at times. His finishing skills leave something to be desired but if his hands and mind ever catch up to his feet he could end up being the second best NHL center from this draft class. Jon’s Take: So if Dante Fabbro is a good right handed defensive option on his way to go excel at Boston University, a team might equally be interested in drafting a RHD who managed to put up 25 points as a Freshman on the BU blueline. McAvoy is one of six truly strong defensive prospects that is projected to go in the first round, and beyond that it becomes a matter of throwing darts. With Fabbro and McAvoy being the only two right handed shots they could hear their names called early if teams are drafting for need over best player available. Tom’s Take: McAvoy is becoming the lost man in this year’s first round defense group. He’s not overly big, he’s not overly flashy, but he just finished a season at Boston University that you rarely see from a defender – let alone a freshman. He’s by no means a puck-moving defender but he is more than capable of handling the puck. He makes good decisions and has a nice outlet pass. McAvoy is the kind of defender that you don’t necessarily notice every shift, but for a good reason. He’s solid, reliable and plays a style of game that will fare very well in the NHL. He can add offense from the back-end but in games where he doesn’t, he’ll still contribute to the team. He’s possibly the closest to the definition of ‘all around’ defender that you’ll get in this year’s draft. Jon’s Take: Kunin already playing in the NCAA is a nice bonus and the fact that he’s been successful there already makes him seem like a good bet on draft day. The fact that Wisconsin is upgrading their coaching staff to the Granatos is a good sign that he’s going to be well developed by the time his NHL team is ready for him. Putting up 17 goals as a freshman is a good start, but Kunin is looked at as a good two way player too, which may read to some as he’s going to be a third liner. It’s likely that Kunin still has enough upside beyond that to make him worth a pick, especially for one of the teams that is making their second pick of the round around that time. Tom’s Take: Kunin is a high volume shooter that put up an impressive goal total playing as a freshman at the University of Wisconsin this past season. He is a very smart offensive player that is always looking to shoot first when he has the puck in the offensive zone. He has a very accurate shot that might have to get a little stronger to have success scoring in the NHL. He’s a decent skater but doesn’t have the explosiveness that you like to see from top-end offensive talent. Kunin will likely need at last another two years at the NCAA level to polish his game and get stronger but he could end up being a solid middle-6 winger at the next level. Jon’s Take: Bellows has been a beneficiary of playing on a line with Clayton Keller, but that’s not to say that he’s not talented in his own right. Bellows is one of the better pure finishers in the draft and isn’t someone to shy away from the high danger areas of the ice. Tom’s Take: Bellows is a guy who has sat in the middle of the top-30 all year with next to no fanfare. It’ probably has a lot more to do with being overshadowed by his linemate than anything else. Playing with Keller, Bellows showed this season that has a ton of potential to become an high-end finisher at the next level. He has a very quick release and accuracy to his shot that allows him to score the pretty ‘goal-scorer’s goal’ but will also take the puck hard to the net with the ability to finish in close. He’s got a strong frame and very good instinct that makes you think he will be able to score as a professional. Jon’s Take: With more and more Russians deciding to come over to North America as free agents in the past few seasons, it seems likely that the stigma of taking a Russian in the first round should be gone as well. That will be a good thing for the team that selects Rubtsov who was nearly a ppg player on Russia’s U18 team. His late birthday should also help his stock, as does the short supply of centers. The doping scandal that kept the Russian team out of the U-18s might cause him to slide, but unfortunately that means the rich will get richer and a top NHL team will be landing a potential top six forward for nothing. Tom’s Take: “He’d got tremendous puck skills but needs to badly improve without the puck on his stick” has become a common refrain when discussing Russian prospects. That stereotype can be thrown out the window when it comes to Rubstov. Rubstov is a puck-hound. He always seems to be around the puck whether it’s his linemates in possession of the other team. His improved skating this year has gone a long way in making him a very good backchecker. On the offensive side, he is a player that has the ability to play both an up-tempo style as well as a slower, more methodical game. He has good hands and has become a very good distributor. Rubstov might not have the top-end ceiling of some of the other top prospects but he definitely has the tools and drive to be a solid professional player. Jon’s Take: The depth on London took a toll on Jones’ numbers this season. That and the 12 game suspension that really showcased his undisciplined side. In the glorious age of elite Brad Marchands it’s likely that Max’s reckless and undisciplined nature could equally be a selling point since it will be combined with a power forwards frame and the fact that Jones is someone who regularly frequents the high danger areas of the ice. Tom’s Take: Thanks to the incredible skill on the London Knights, and the nature of his style of play, Max Jones spent most of the season playing a role not usually seen from a player with the skill he possesses. When the team’s top line was away at the World Juniors, Jones’ game took off as he became the go-to offensive threat for the Knights. He has the skating ability and puck skills to be a top-6 forward in the NHL, while playing with an edge to his game that will perfectly compliment a team’s superstars. Jon’s Take: Like Kieffer Bellows, Gauthier is one of the elite finishing forwards available in the first round. He knows how to use his size and release to make the most of the high danger areas of the ice, and he’s the only Canadian in the draft who has the World Juniors on his resume. He might be taking a hit for being a one dimensional scorer, but that’s not a bad dimension to have, and the World Juniors did prove that while he was horribly underutilized in his role, he can also serve as a hard nosed checking forward. Tom’s Take: Gauthier took a tumble down the rankings in the second half of this season – some would say with good cause. While many had compared him to fellow QMJHL winger Pierre-Luc Dubois, Gauthier is far more one-dimensional. He can score goals. That’s not a bad start, but there are far too many holes in his game to overlook. He doesn’t create offense for his linemates well enough, he doesn’t show a defensive awareness you want from a top player and he simply doesn’t play a strong enough game when the puck isn’t on his stick. Gauthier has a lot of the physical tools you look for in a top-6 winger but many wonder if he has the mind to use them properly. Jon’s Take: Like Logan Brown, Riley Tufte is a giant forward. Unlike Brown, Tufte’s strong offensive performance is largely limited to Minnesota High School competition, and his USHL numbers don’t particularly standout. Tufte looks like a worthwhile power forward project for a team that has just completed a decent playoff run. He could be a worthwhile prospect to have in your system when you don’t have the need to rush him. That being said, University of Minnesota-Duluth is an underwhelming place for committing a prospect to for their long term development, but “you can’t teach size” so someone is going to take Tufte in the first. Tom’s Take: Tufte is another guy that may be badly overvalued because of his height. He is a huge forward that wasn’t able to produce offensively when he made his move to the USHL. In a second-tier junior league, Tufte wasn’t impressive, so why is he ranked so high? He is more of a playmaker than a scorer. He’s pretty good with the puck on his stick and is able to stick-handle in traffic to maintain possession for his team. That said, it’s hard to tell if he will be able to do that at the NCAA level let alone in the pros. There are some raw skills there but he is a project that will be a long way of for whoever drafts him. Jon’s Take: If DeBrincat has a little bigger we’d all be singing his praise, but unfortunately even when the NHL is learning to come around on 5’10 players, they haven’t been quick to do the same for 5’7 players. DeBrincat has a great shot, and has been using it for the high danger scoring areas of the ice. If you trust that a small forward can still reach those areas of the ice against larger, tougher competition, DeBrincat is going to be a steal. If you have some reservations about that, and the fact that there isn’t anything else to DeBrincat’s game to make him an asset, you probably see him more as second round option. Tom’s Take: “It’s another example of the size-bias among scouts” was the common refrain. The fact is DeBrincat was never as good a prospect as his goal total suggested and he should not have been thought of close to the top-10. There is no doubt that DeBrincat has very good scoring ability. He is a high-volume shooter that can find open space and put himself in a position to take advantage of scoring opportunities. He has a great nose for the net but his puck skills leave much to be desired and he won’t often create offense for his linemates. He doesn’t play like the typical small-winger we’re used to seeing. He doesn’t have the crazy speed an allusiveness of a guy like Gaudreau or Hudler. He’ll never be a top line offensive cornerstone but DeBrincat may be the perfect pick for a good team selecting late in the first who can plug him into the lineup in a few years as a secondary offensive option. Jon’s Take: Moose Jaw was an interesting team this year. At the beginning of the season it seemed that Brett Howden was going to be a good two-way center option, but riding shotgun to Dryden Hunt and Brayden Point’s seasons Howden has showcased the offense that can be expected from him as well. Next season will be the true test of where he’s at once he’s the go to option for the Warriors, but for right now, he’s an attractive option in a draft that doesn’t have too many 6’2 near point per game centers. Tom’s Take: Howden probably projects as a third line center down the line. He only had a decent season offensively but he was incredible in the playoffs for Moose Jaw. He is a three-zone player that can be relied on to kill penalties as well as work on a powerplay. He’s a good playmaker down low and isn’t afraid to put up with rough stuff it it means creating offensive opportunities for his linemates. That said, he’ll need to put on some muscle to play the same role in the NHL. Howden is a projectable player that won’t stand out at the top of anyone’s prospect depth chart but could end up as a valuable piece of a good team down the road. Jon’s Take: Asplund playing his entire season in the SHL has to be viewed as a huge plus. As does the fact that he was there for the majority of last season as well. And when Asplund was playing strictly in his age group, he managed 5 points in 7 games at the World Juniors. All of this looks pretty good for the team that drafts the 5’11 center. The fact that Asplund isn’t putting up points in the SHL shouldn’t be too much of a deterrent, though the amount of ice time he’s had compared to others in the draft is a small concern. The fact that he hasn’t put up significant numbers in the SHL isn’t out of the ordinary, but there isn’t anything particularly extraordinary about Asplund either. He’s a good safe pick for the late part of the first. Tom’s Take: Asplund plays a game that seems a little more mature than many his age – likely due to the fact that he’s already played two pro seasons in Sweden’s top league. Asplund is a three-zone player that uses his instincts to contribute with and without the puck. He’s not the biggest player, but he’s smart enough that it won’t matter. He’s a natural center that will use his mind where others might use their brawn. He is more of a facilitator than a goal scorer and probably projects to be a 3rd line center down the road. Jon’s Take: Abramov, like DeBrincat is a smallish forward who has some very real offensive “flair”. Vitali’s numbers aren’t as impressive as DeBrincat’s, but his style of play might transfer to the pro game a bit easier, and the slight height advantage helps too. Tom’s Take: What he lacks in size, he more than makes up for with hockey IQ. He’s a very smart player that knows how to use his strong skating and great instincts to get around his lack of size and strength. He is a very impressive offensive player but the fear is that the QMJHL is littered with small forwards that put up big numbers but couldn’t do it at the next level. The NHL isn’t what it once was and the smaller forwards are proving they belong but Abramov is still a risky pick in the first round. Jon’s Take: He’s very tall and GM’s like tall defensemen. Logan Stanley thrives at a lot of the old way of doing things traits that GMs and scouts have a hard time shaking themselves from. Stanley is being sold as a shutdown defenseman which seems more like condemning him than praising him. Tom’s Take: The fact that Stanley is being projected as a first round pick – and in many cases top-20 – astounds me. He is big, I get that. But he’s clumsy, slower than average and hasn’t shown the instincts you want to see from a high-end defensive prospect. He has a long reach that allows him to break up plays and he is a decent one one one defender – although that can likely be explained by the fact that he’s bigger and stronger than 99% of the junior players he faces. Someone will see him as a project that can be developed and they will take him much higher than they should because he’s huge – and you can’t teach that. Jon’s Take: Laberge is on the radar because of a standout CHL Top Prospects Game. He has every right to be in consideration for the first round, and he fits in with other two way center options like Asplund and Kunin. Tom’s Take: After being selected 2nd overall in the QMJHL draft a few years ago, Laberge hasn’t grown the way many had expected. He had a decent season with Victoriaville, but really impressed scouts with his performance at the Top Prospects game. He is a two-way forward that forechecks with a tenacity that you hate to see from an opposing player. He has a knack for causing turnovers and winning battles in the ‘dirty’ areas. That said, Laberge also has the hands to play an offensive game built on finesse. He’s got a good shot but doesn’t always use is enough as he spends a lot of time looking to be a playmaker first. Jon’s Take: Out of nowhere at the end of the season came another BCHL prospect to keep an eye on. Like Fabbro, a defenseman, but unlike Fabbro or Jost he didn’t get the exposure of the U-18’s for most of us to know what to think of him. What we do know is that he’s a well rounded defender who put up points in a lower league and is off to an improving St. Cloud State program for the next few years. Tom’s Take: Destined for the NCAA next season, Cholowski spent this past season in the BCHL – which is likely why he is being viewed as a higher risk than some of the other defenders in the top-30. He didn’t play at the U18 so unlike Fabbro, it’s hard to judge him against the higher calibrate opponents. By all accounts, he has all the tools you look for in a defender. He’s smooth on his skates, smart with the puck and played in all situations for his team. We just don’t know how that translates over to playing against a higher level of competition. Jon’s Take: There are several themes that are running through the first round of the draft, and Tage Thompson falls into the “check out this really tall guy” theme. Thompson has dominated on the powerplay for the University of Connecticut, but hasn’t produced much offense at even strength. As a freshman, some slack can be cut, but Thompson will definitely be a project pick and whether UConn is best place to develop a project remains to be seen. Tom’s Take: Thompson his another huge center that I feel has not business being considered a first round pick. He had a decent offensive year at UConn, but it’s really the first time he has shown he can produce. Thompson is very very raw. H has a decent defensive game and plays a lot on the PK, but his skating and puck skills have a long way to go before he should be considered a high end prospect. We figured we needed at least one Honourable Mention in our list and both Tom and I think that the 31st ranked Will Bitten should easily be higher than a number of the players on the list. Samuel Girard, Tyler Benson, Boris Katchouk, and Kale Clague were some other near misses on the list. Jon’s Take: Bitten is a player who really put himself on the map during the U-18 Tournament. His size may count against him, but talent wise he seems like he should be more in discussion for the top 20 than the first round bubble. Bitten’s vision put him a cut above the rest and he might make for a worthwhile high risk, high reward pick, though whoever drafts him needs to move him out of Flint as soon as they get him. Tom’s Take: Bitten is a great skater with great speed an allusiveness. He has the puck skills to carry the puck effectively and create scoring chances for himself as well as his wingers. He’s a smart player may be getting undervalued because of how bad the Flint team is around him. In a terrible situation this season, Bitten was still able to put up impressive numbers and with a big of regularity next year could become an OHL star. Born in July, Bitten falls into the increasingly popular theory about later birth-dates being better draft picks because they are impressing at a younger age and have further room to grow post-draft. Thanks to the Memorial Cup, World Under 18 Tournament, and a number of ranking services taking a few months off before finalizing their rankings, we’ve seen a number of changes in the Final* Consolidated Rankings. Players like Brett Howden have emerged out of nowhere despite Moose Jaw having an underwhelming WHL playoff run. What’s also interesting is the range that exists on certain prospects, and how it’s largely based on just one or two ranking services. Dubois was at the number 4 spot until the lower outlying ranking (8th) from McKeen’s was factored in. Luke Kunin is ahead of German Rubtsov, and Kieffer Bellows largely because of his favourable 9th overall ranking from DraftBuzz Hockey. Interesting though is that if you take away the high and low ranking for each of the players, there is next to no change in the consolidated rankings. Fabbro and McAvoy switch spots, Rubtsov and Bellows flip as well and finally Cholowski and Thompson change spots. Basically the rankings can handle some crazy. Below is the breakdown of how each scouting service ranked the prospects over the course of the year, how and when they made changes, and it includes a lot of names that didn’t make the cut in the top 30. Over 60 different players received some consideration as a potential first rounder over the course of the season, and even in the final month there was 52 different players that had at least one top 30 placement out of the nine ranking services. Damien Cox’s Sportsnet Rankings are based on professional scout surveys. They are a somewhat watered down version of Bob McKenzie’s rankings at TSN because it’s easy to assume that Cox has nowhere near the level of connections that McKenzie does. Sportsnet released their final rankings just prior to the Memorial Cup. The rankings show a fairly radical change from October to May, and that’s not unlike what we’ll see in many of the other services as well. Chychrun starting as the second best prospect in the 2016 was considered the norm. Having Patrik Laine as high as fourth and Puljujarvi as low as 6th was different though. For the most part Sportsnet nailed the top have of the draft early and just fell more in love with Dubois as time went on and gradually dropped Chychrun as well. The last minute drop of Gauthier and stellar U-18 rises of Logan Brown and Tyson Jost are interesting. The last two being a good example of recency bias. Having Logan Stanley as their 14th overall player and having Filip Gustavsson as their top goaltender will undoubtedly be their hottest takes. ESPN’s rankings are completed by Corey Pronman. Similar to how TSN has Craig Button’s standalone rankings, ESPN has Corey do the same. His final rankings came out prior to the Memorial Cup and completion of the World Hockey Championships. I won’t be posting a table of Corey Pronman’s rankings because they are behind a paywall, and I’d imagine that’s where they want them to stay, but I will say that having Chad Krys at 5th overall was one thing that stood out in the initial ESPN rankings in September. Like a lot of other people, Pronman also had Dmitri Sokolov in the top 10 before banishing him from the top 30 in swift fashion. Corey Pronman was however the only one who brought Sokolov back into his top 30 for his final rankings. ISS was the most consistent of all of the ranking services, as they had new rankings at the beginning of every month. I can’t understate how much that meant to me when compiling the consolidated rankings. They were also the most stable in June, and just made a couple of small tweaks at the top of their order, swapping Laine and Puljujarvi and also Tkachuk and Nylander. ISS came from a very unique place at the start of the year having Max Jones as a potential top 3 pick, so it’s not too surprising that he’s still at 14 in June, with ISS placing him higher than any other service. ISS also stayed loyal to keeping Jakob Chychrun as their top defenseman and even though he fell from the number two spot, he’s still 7th overall in June and a few notches ahead of Juolevi and Sergachev. The most interesting things to note about the ISS Rankings are that they repeatedly came back around on Mitchell Mattson, elevating him into the top 30 three times throughout the year. Mattson is similar to Riley Tufte in that they are both huge high school players who struggled in the USHL this season. Mattson is committed to the University of North Dakota, and while considering him as a first round pick seems like a stretch, he could be a good project player to add to an organization. You’ll be hard pressed to find a list that more closely matches the final consolidated rankings than the June list put out by Future Considerations. 28 of the 30 names on the consolidated list are also on their list, and if anything there list speaks to me more as they didn’t include Logan Stanley who doesn’t crack my personal top 60. The list has come a long way from the initial one that included Chad Krys, Max Jones, Dmitri Sokolov, Sam Steel, and Sean Day in the top 10. Kale Clague, Ryan Lindgren, Luke Green, Max Lajoie, and Nick Pastujov were also interesting picks that quickly slid from their list, but after a reassessment once their junior seasons started, the Future Consideration list became very stable, and other than German Rubtsov’s climb there doesn’t seem to be much that goes against consensus. We’ve only been looking at the DraftBuzz rankings since December, but what we’ve seen is a publication that is very open to changing their mind on players. We’ve also see significant rises for Logan Brown, Jake Bean, and Mikhail Sergachev, and we can also see that Draftbuzz was quick to buy in on Laine, Dubois, and Bitten, who other publications weren’t as immediately drawn to. The end result is a list that has it’s question marks (Kunin @ 9 and Wade Allison @ 29 are a couple) but generally a list that isn’t afraid to be different, and based on their draft guide, it’s arguably one of the more analytics driven lists. I’ll start off by saying that the Hockey Prospect Black Book is a beautiful draft publication that I encourage everyone to read. It’s by far the most detailed and insightful and reflects a lot of their thinking in their rankings. That’s probably what a lot of people were looking for when they saw that Alexander Nylander was dropped six spots since February. Given the large gap between the Final rankings and the ones in February, it’s not surprising that there are a number of new players on the final list and there has been some radical changes to the order. Still there aren’t any names that don’t look like they belong there. Looking back to the initial August list there are a number of names that have held up nicely, but others like Luke Green, Denis Alexeyev, Jacob Cederholm, and Dmitri Sokolov that have fallen off fast. I wouldn’t be surprised by a resurgence of Victor Mete based on the Knights Memorial Cup run, and he could sneak back into the Top 30 on draft day. McKeen’s made waves in January when they put out a list with Laine ahead of Matthews on it and sparked the debate over who would actually go first overall. It’s safe to say that now that we know the Leafs are picking first, Matthews is all but a lock to go there and most of still believe that he’s unquestionably the best player available, but kudos to McKeen’s for giving us something to talk about. McKeen’s also deserves some credit for being the first to get Dennis Cholowski on a lot of radars. The BCHL defenseman was relatively unknown outside of those actually scouting games before he jumped onto their list in April replacing fellow BCHL defender Dante Fabbro. Fabbro (rightly) has since returned to their top 30 which has cooled some of it’s takes, like having Michael McLeod 3rd overall and having Libor Hajek in their top 20. Craig Button’s rankings are certainly good as conversation starters and provide an unique perspective. I find myself constantly disagreeing with them, but as a former GM and head of scouting, they are certainly rankings worth including in the consolidated rankings since they capture a perspective that could be very similar to a number of front offices around the league. Button was the last hold out of the scouting services to not have Patrik Laine at #2. He also made some drastic changes in his final rankings, jumping Logan Brown 20 spots and being the lone hold out on including Max Jones and Julien Gauthier in his top 30. Apparently Craig Button has something against high danger scoring chances. Unfortunate for us and pretty much everyone who considers this the quintessential list, Bob McKenzie’s Draft Special isn’t airing until the Monday before the draft. Rather than hold up the rest of the list, we’re going with the rankings Bob has provided to date and we’ll follow up on how the Consolidated Rankings compare to Bob’s list and note any changes to occur in the Rankings as a result of updating his list. Consider this bonus #content when it comes out. It’s also worth noting that no one that has appeared on Bob McKenzie’s list didn’t also receive consideration from one of the other scouting services. As it sits right now, from McKenzie’s February list there are three players he has ranked that fall out of the consolidated top 30 (Nathan Bastian, Libor Hajek, and Dillon Dube.) It’s safe to say that these players stand a very good chance of not making the top 30 on his final list. On their own, these lists weren’t lacking in their share of hot takes, but as one consolidated list, I think we’re looking at a reasonable approximation of how the first round could play out. There obviously a strong possibility that some recency bias could come into play and Memorial Cup players like Victor Mete and Kale Clague could creep up into the mix and there’s certainly a case for the pure numbers players like Adam Mascherin, Will Bitten, and Jordan Kyrou who aren’t represented. What is still very clear is that there are a number of tiers to the first round. While we have been tracking draft rankings since August, we have only been putting together consolidated draft rankings since early December. Since that time we’ve seen some the following changes. Logan Brown (9th), was the biggest gainer climbing 11 spots from where he was originally ranked. Clayton Keller (8) and Luke Kunin (17) disprove my size theory as they both jumped 7 spots. Rasmus Asplund who wasn’t in the top 30 in December finished at 25 showing a significant jump as well and an honourable mention to Brett Howden who started at 28, fell out of the top 30 through May, but returned to 24th overall in the June rankings. The not so distinct honour of sliding the furthest since December belongs to Tyler Benson (ranked 18th in December) and Kale Clague (ranked 19th in December), both who finished outside the top 30. Injuries played a big part of Benson’s slide, but Clague’s is a bit more based on preference towards forwards with higher picks. Sam Steel (23rd in December) being outside the top 30 in June makes it entirely possible that the scouting world just doesn’t think that highly of the WHL. Julien Gauthier (21) is another slider who managed to remain well with in the top 30, but slid 14 spots since December. Another capable player, but concerns about being one dimensional rightfully bumped him back a bit. The most famous draft slider this year seems to be Jakob Chychrun (12) who fell 8 spots. By most standards he had a solid year, but after starting the season as the 2nd or 3rd ranked prospect behind Matthews and Puljujarvi he was passed by a number of players who simply stood out more. There’s been a lot of debate on whether or not this is a good draft year or not, and unfortunately the 2016 class is going to be compared to the 2015 group which was terrific. This year it looks like the top 12 teams will fair very well, but it’s not going to be where every team leaves with their new top organizational prospect. There’s a lot more going on in the rankings than what we’ve been able to cover here and at the very least it will be a convenient resource to compare who got it right on draft day. With the completion of the Stanley Cup Finals we now have a final draft order. Please note that the Arizona Coyotes have an additional 2nd round pick at 56th overall because they did not sign Connor Bleackley. 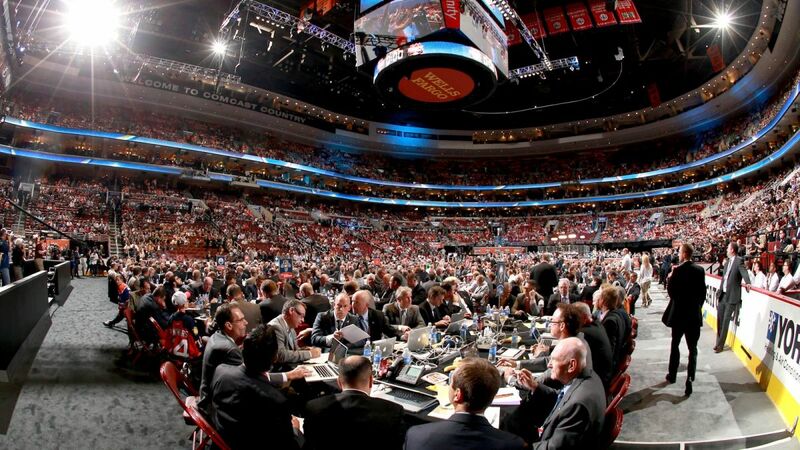 Should the Leafs Acquire More First Round Draft Picks?